New marketing agency thrive picked up the Heart of the Community award at the Make Your Mark event on Aycliffe Business Park. The award – the last of the night – was designed to celebrate excellence in corporate, social and ethical activity. It sought to “identify organisations which best exemplify the social and community spirit which is at the core of Aycliffe Business Park”. Au Fait Marketing and design firm Echo Graphics merged to form thrive in Newton Aycliffe, and now operates with a 10-man team from offices at the HUB Workspace. thrive work with a number of local companies but, more importantly, they manage the social media account for the Aycliffe Business Park Community on a voluntary basis, as well as managing the weekly #AycliffeHour on Twitter every Thursday (3-4pm). thrive beat off competition from Gregg Little Testing Centre and Newton Press to bag the Heart of the Community award. 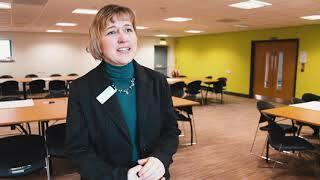 Director Rachel Townsend Green said: “As an Aycliffe Village resident and having spent many of my formative years living in the village, I am totally passionate about the area. “I don’t think that we celebrate it nearly enough – not just all of the great businesses, but the wealth of history, the various communities, the fact that we are a great regional hub, have some amazing educational and training opportunities… the list is endless. “I am immensely proud to have been asked to be part of the community and to have been invited to join the steering group but would like to point out that it isn’t all about me! “I have a superb business partner (and friend) in the talented Johnny Woods and we are both extremely fortunate to have the support of a great team who make us look and sound good! 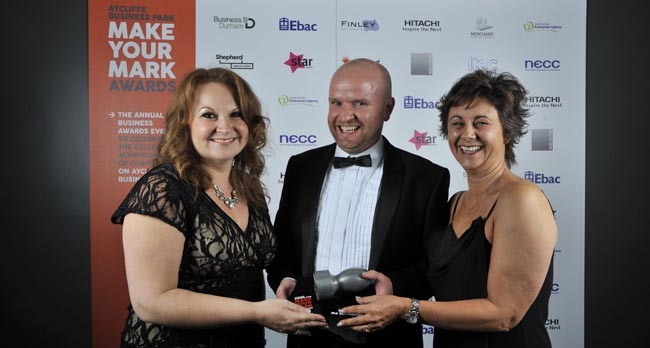 • Rachel is pictured (above, right) with fellow director Johnny and Kerina Clark, managing director of Xcel Centre which sponsored the award. Click here to see a gallery of pictures from the evening. Click here to see the full list of winners and shortlisted nominees.